$3.29 & FREE Shipping on orders over $59. Use this yeast nutrient as your "secret weapon" when your yeast starts to lag or you just want to ensure a vigorous ferment! Supplementing with yeast nutrients reduces lag time and give the yeast a boost during sluggish or stuck fermentations. 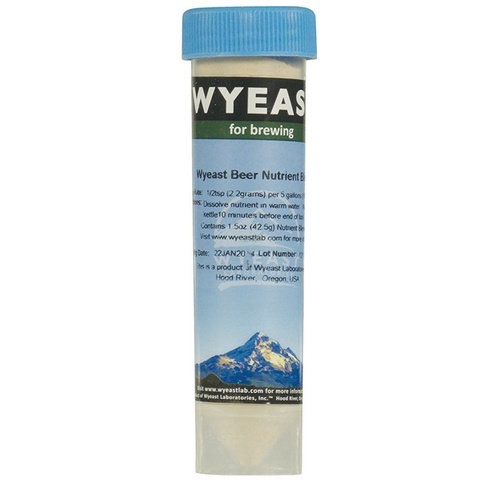 Wyeast Yeast Nutrient gives your yeast a great start during propagation and provides the nutrients needed to maintain a healthy, active ferment: a blend of vitamins, minerals, inorganic & organic nitrogen, zinc, phosphates, and other trace elements that will benefit yeast growth and complete fermentation. To use simply dissolve Wyeast Yeast Nutrient in warm water and add the solution to your kettle 10-15 minutes before the end of the boil. Use ½ tsp (2.2 grams) per 5 gallons (19 liters) of wort. Wyeast Yeast Nutrient will remain stable for 1 year if stored in an airtight container in a cool environment. Yeast booster is always appreciated. I use this in all of my batches. Good stuff! Even yeast needs a helping hand now and then. Always use nutrients - this one has zinc. Use it in all my beers to give the yeast a good start. I am running out of it so I ordered more! Wyeast Nutrient is the best there is! Nutrient for big yeast starters. 1/2 tsp. in every batch. I add a little to my starters and close to flame out for big batches. Fermentation seems to pick up sooner than without. Adding it also makes me feel like I'm being a good boi brewer, so there's that. Each 1.5 oz is enough for aprox 30 gal. 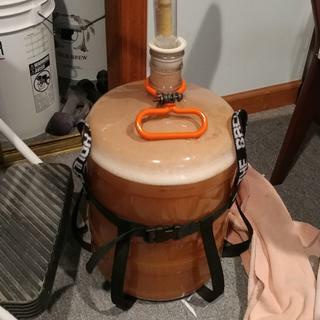 I have been home brewing for 24 years and I finally decided to try some yeast nutrient. Trusting wyeast products and liking the low price I gave it a try in a 1.058 IPA with a single pack of rehydrated S04 dry yeast. I have pitched many packets of S04 in the past but I have never before seen this level of fermentation with it. 5 hour lag time and off it went. Finished fermenting at 1.012 in 36 hours at 61 degrees ambient temp.. Just a quarter teaspoon of yeast nutrient late in the boil. I will most definetly continue using this great product. Can't make a yeast starter without it! Must have as it contains zinc to feed the yeast. Excellent product to use in yeast starters and in the boil kettle, so the yeast will be healthy and be able to fully attenuate the beer. Some other brands do not contain zinc but this one does! I use this in all my starters and boils. I have never done any testing to prove it adds anything detectable but I consider it a cheap insurance for yeast health and viability, which I know is absolutely paramount in my brewing. Really helps to get a quick and vigorous fermentation. Just add near the end of the boil. Improved yeast handling (correct starter size, oxygenation, nutrients) has had the biggest effect on improving my beers. I use this product each time I have brewed and it has helped to get the yeast going in less than 12 hours. All my batches have been extremely high active. I have also only use the dry yeast when I brew. I not only use this product with all my brews, I would highly recommend this product for anyone that brews. It gives the yeast the nutrients it needs to survive and reproduce.